View super nice. She enthusiastically instructed us. Kitchen for self-cooking. Jacuzzi. 750m to Oia Castle. Easy to find. Incredible views and the friendliest, most helpful staff imaginable. Irene is a gem. Hot tub on the terrace was a wonderful spot to view the sunset. Irini, the woman in charge of the reception was so helpful and kind. She gave us all the recommendations and assisted us with everything we needed. The area where the apartment is located is just perfect, extremely beautiful views with the caldera and the white houses. We stayed at the apartment with private jacuzzi outdoors and we enjoyed that a lot. We would definitely like to come back to Gabbiano for sure! We give it a 10! Perfect stay, Irene was so helpful . The views are out this world. I was lost for words how beautiful it was l.
This is the first 10 I have ever given a property. There is not enough room to describe all of the superlatives. The facilities and the location are perfect. Close enough to walk 10 minutes into the heart of Oia but also just outside the maddening crowds. I viewed one sunset from the town where everyone crams themselves and viewed one sunset from the apartment: the apartment view was just as nice but in the comfort and quiet of our balcony! I cannot speak enough about the generosity and sincerity of our hostess Irene. She was incredibly helpful and attentive. I could go on and on: Stay here and experience it for yourself. Irene was a great host! She had many recommendations for places to eat and things to do around Santorini. Each of the recommendations we tried was excellent. She was available 24/7 for anything we needed. The sunset view, the adorable and comfortable cave house, the outdoor private pool, and the friendly host. I cannot say enough wonderful things about this property and our host Irene. Her smile and happy disposition was infectious. Not to mention her restaurant and catamaran suggestions were right on point. We even ran into her during one of our dinning nights. While first approaching the property I was disappointed, but then we turned a corner up the path and I literally had to gasp for air. There it was - the views you dream of. Words cannot express the beauty of this island. The sunset from our private jacuzzi was spectacular, and the area is in the more quieter part of Oia. Lock in a great price for Gabbiano Traditional Cave Houses – rated 9.7 by recent guests! Set on a natural volcanic cliff, Gabbiano Appartments are located near the entrance of Oias’s village. Guests enjoy unobstructed, panoramic views of the Caldera, the sparkling Aegean Sea and the sunset. In traditional Santorinian style, Gabbiano Apartments interiors feature white-washed walls, a romantic master bedroom with canopy, king-sized bed, a comfortable living room with extra sleeping space, bathroom and kitchen. Guests can choose between soft and hard pillows, or two color combinations of blankets and bed covers. All of the sleeping equipment is made of natural and ecological materials. The Gabbiano Apartments are conveniently just a few feet from the main road, the bus stop and the nearest parking area. When would you like to stay at Gabbiano Traditional Cave Houses? This is a small complex of three really old cave houses of Oia. The complex consisted of a house, a "canava" that is to say the old cellar for wine and a stable for the donkey. All of them were recently transformed to three luxury houses with all the comforts. 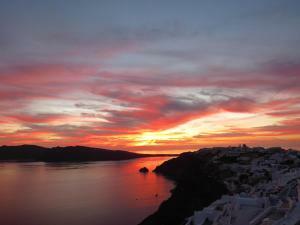 The big advantage is the 180 view to the ocean and the sunset from a place far from the crowdy and noisy center of Oia. I am an architect and importer of fine Argentinean wine. This Oia neighborhood is the perfect combination of tranquility and panoramic views. Gabbiano Apartments is based on a natural rock coming out of the cliff. Therefore has pure advantage and enjoys more than 180 views to the rest of Oia, the ocean, the volcano and the sunset. House Rules Gabbiano Traditional Cave Houses takes special requests – add in the next step! Gabbiano Traditional Cave Houses accepts these cards and reserves the right to temporarily hold an amount prior to arrival. Please inform Gabbiano Traditional Cave Houses of your expected arrival time in advance. You can use the Special Requests box when booking, or contact the property directly using the contact details in your confirmation. The indoor area was definitely nice, but didn’t have that “luxury” feel I might have expected for the location. But of course, the outdoor spaces more than made up for that! The view!!! Amazing. This place is amazing for its outdoor spaces... loved having breakfast on the front patio with the most beautiful views you’ve ever seen! The hot tub was also spectacular with the same amazing views!! The only minor complaint is that the room key turns on the power to the room and you're only given one key. I understand the power-saving nature of this approach but it was frustrating as I was unable to charge my electronic devices unless I was in the room or close by and able to leave the key in the power switch. I looked at many different options in Oia and by far this was the best I could find when it came to location, space, and amenities for the money. I was only here for one night but could have easily stayed for a week or more. The apartment had plenty of space and included a kitchen. I was welcomed upon arrival, a porter carried my bag to my room, I was given a tour and the keys all within the first 10 minutes. Walking to Oia was easy. Many local restaurants to choose from. And the view - well, it's hard to beat. Location and apartment was perfect. Management was the best, extremely reliable and helpful. Gave great tips and advise when asked. Irini made our stay on beautiful santorini the best time possible. Irini was an AMAZING host. She made our experience in Santorini worthwhile. The in-suite personal hot tub is the perfect place to spend all day, especially the sunset. We honestly preferred the hotel room to walking around Oia! Great overall experience. Irene is absolutely outstanding. The location is perfect, the place is clean and peaceful. Can’t wait to book it again. The apartment is little bit difficult to be found but still ok. no other special disappointed. The view outside our room is astonishing which can see the Aegean sea directly. The jacuzzi is also amazing which is just near the edge of the cliff. The service of the apartment is good and the owner is very helpful and friendly. must introduce this apartment to my friends who will travel to Oia in the future. The apartment also near the main street and the city centre which only need about 10min by walk. Great location just outside Oia centre, so nice and quiet. Excellent views from the apartment/terrace over the caldera and Oia town. Great facilities with the kitchenette, wi-fi, aircon and hot tub. Very private apartment. Irene couldn't have been more helpful to us with restaurant suggestions, bookings, hire car, airport transfers and going the extra mile to get some champagne glasses for us to celebrate our honeymoon. She really did help make the experience even more special for us. The biggest recommendation from us is that we'll be back! Magnificent location and view. Wonderful welcome and service. Perfect. Where to start with Gabbiano apartments- absolutely everything was perfect for our stay there while on honeymoon. The view, the apartment, the little private pool was out of this world. It’s so beautiful. Irene was so lovely and helpful during our stay, helping us to find places to eat, leaving some useful food in the apartment for us and helping us to sort transport and activities. We had a look at a hotel right next to us and for half the price we had the same view with a private little pool. Will definitely be back to beautiful santorini and will definitely be staying at Gabbiano apartments again.